If oncologists had been holding their breath waiting for just the right tool to help them wipe out cancer, one might have heard the entire profession collectively exhale earlier this year when Roche Tissue Diagnostics announced the launch of its latest solution for digital pathology – the uPath enterprise software. U stands for universal, a word choice that reflects Roche’s belief that its tool will one day be commonly used by pathologists the world over. What makes this tool so universally important? According to the American Cancer Society, 1,762,450 new cancer cases and 606,880 deaths from cancer are expected to occur in the United States in 2019. Speed and accuracy matter when you’re a patient waiting for diagnosis and treatment. With the ability of uPath enterprise software to give researchers as well as oncologists and their patients better answers faster, Roche’s newly released digital pathology workflow software could one day be just the weapon of mass destruction the world so desperately needs in its war against cancer. Imagine if doctors had to use manual typewriters or rotary-dial telephones when communicating a prescription. Incredibly, in a profession where seconds and accuracy count, the majority of pathologists around the world today still rely on their own pair of eyes and a microscope, invented in 1590, to make a medical diagnosis. If a second opinion is desired, those slides must be couriered or mailed – costing precious time in the life of a would-be cancer survivor. Furthermore, slides must be physically stored in a box at the risk of damage or loss, making subsequent comparisons difficult or impossible. To remove such workflow obstacles, Roche unveiled in March 2018 the VENTANA DP 200 slide scanner, launching for research use only in the U.S., and for clinical use outside of the U.S. This line scanner with a dynamic focus allows technicians to permanently digitize high-quality microscopic images of biopsy tissue in less than a minute. These tissue images are very large files, about a gigabyte each. Roche continues to make great strides in reducing the time it takes to transmit such large data files – and now, coupled with uPath enterprise software, those images can be analyzed, compared, shared, stored and retrieved in seconds from anywhere in the world. Such technology could provide virtually any patient, anywhere, access to a second opinion from the most experienced specialists, in effect, democratizing medical access. In addition and perhaps most exciting of all, Roche is developing, through artificial intelligence, machine-learning and deep learning algorithms for all kinds of cancers that will assist researchers and pathologists in evaluating cells on a level never before possible – leading to more detailed, accurate and ultimately successful treatment plans. While some labs have embraced it, the uptake of digital pathology is still relatively low, according to Michael Rivers, VP, Roche Digital Pathology. However, with the acceleration of technological advances such as streaming to speed the digital image review, its time has truly come. “In anatomic pathology it’s all about tissue. We’re working with a biopsy. That tissue is transformed into a very thin slice (4 microns) and put on a slide. We have the chemistry and color stains to highlight biomarkers of interest. Each color represents a different biomarker. A pathologist can now look at the digitized slides and say, ‘This is not cancer or this is cancer or it’s this type of cancer and this is the best course of treatment and likely outcome,’ ” Rivers said. “Our understanding of cancer is becoming more complex,” said Dr. Eric Walk, chief medical and scientific officer at Roche Tissue Diagnostics. “The markers we have to use are more complex. Pathologists are confronted by these complexities and they are asking us for our assistance. It’s not about replacing pathologists – it’s about assisting them in getting the right answers. “The relevant revolution here is immunotherapy. We are seeing incredible progress in cure rates and survival rates with this class of therapy. The bottom line is we don’t yet understand how to apply these technologies to all patients. We’ll be entirely dependent on these kinds of algorithms to help us unravel the complexities. And that’s happening right in this room. “With Roche’s global reach, there is close collaboration between assay scientists and imaging scientists between Tucson, Santa Clara (California) and around the world. Right now, digital pathology has the potential to get us to the right answers faster. In the future it will be absolutely essential,” Walk said. “Image analysis algorithms use machine-learning and computer vision to complement a pathologist’s experience – improving the value of diagnosis and treatment. And it only takes a few minutes for an algorithm to thoroughly analyze the data in a series of slides. The pathologist is still in full control of the final diagnosis – he or she is simply basing it on a much broader set of data,” Walk said. Driving this tsunami of medical advancement are the more than 1,700 dedicated men and women of Roche Tissue Diagnostics in Arizona and California. This includes engineers, chemists, biochemists, mathematicians, software architects and other professionals. How do you compete for such talent against tech giants like Google, Apple, Facebook? The death rate from cancer in the United States has declined steadily over the past 25 years, according to annual statistics reporting from the American Cancer Society. As of 2016, the cancer death rate for men and women combined had fallen 27 percent from its peak in 1991. This decline translates to about 1.5 percent per year and more than 2.6 million deaths avoided between 1991 and 2016, according to the American Cancer Society in January 2019. “As the No. 1 tissue diagnostic company in the world, we’ve already made an enormous impact. We’ve been in the digital pathology space for 10 years. We launched the slide scanner a year ago March – and it has far exceeded our expectations in terms of uptake. The potential to affect future change is still very great. There have been a committed group of pioneers – but it’s about to become much more widespread,” German said. With cancer death rates already dropping, in part thanks to advances made by Roche and others in recent years, a cancer-free world could very well be in the foreseeable future. By combining innovative digital solutions, streaming technology and artificial intelligence, Roche is adding mind-blowing speed and quality to the cancer diagnostic and treatment process. 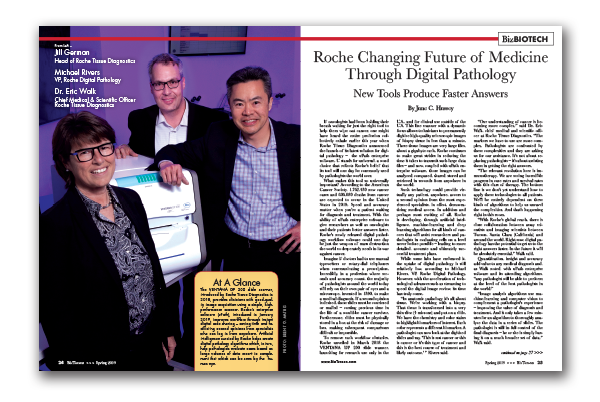 As more and more researchers, lab administrators, histotechnicians and pathologists embrace Roche’s latest product, uPath enterprise software, the transformative potential of file sharing could become as powerful to medicine as it has already become to music, film, literature and photography. The time has come.